How does basic refrigeration cycle work? 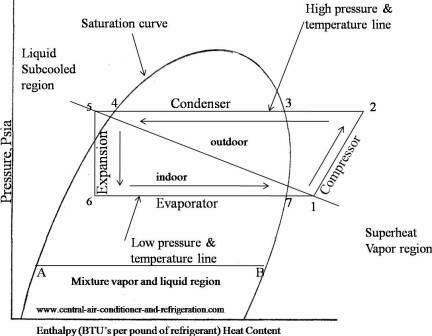 If we are interested in learning how a refrigeration system works, it is helpful to understand from the Ph (Pressure Enthalpy) chart perspective. It makes our life easier. 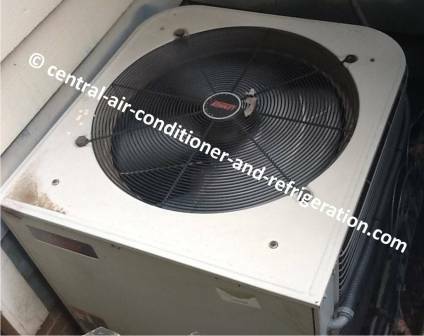 The refrigeration cycle tells us if there is air in the air conditioner units, what to repair after troubleshooting the refrigeration system, if there is enough air conditioner Freon, or if the filter is dirty. We could know the entire thing by knowing the pressure and temperature of the evaporator, condenser, and compressor. Once we have found the pressure and temperature, we plot in the Ph charts to determine what and where sub-cooled and superheat take place in the Ph charts. The Ph chart graphically shows where the physical states of these four mechanical components is and what is happening to the refrigerant within these components. However, first let’s understand air conditioning theory, the basic principle, types of heat, how heat transfers and we’ll discuss how the basic refrigeration cycle diagram works. There are two laws that are significant to understand the basic refrigeration cycle and air conditioning. Thermodynamics’ first law explains that energy cannot be neither created nor destroyed, but can be changed from one form to another. Thermodynamics second law can help us better understand how the basic refrigeration cycle works. Once of these laws state that heat always flows from a material at a high temperature to a material at a low temperature. This is just the basic btw. If we’re interesting, we should take thermodynamic class. We’ll learn all the equation and calculation behind it. As I have mentioned in the residential air conditioning section, air conditioning (the refrigeration cycle) is a process that simply removes heat from an area that is not wanted and transfers that heat to an area that makes no difference. The air conditioner itself does not create heat, it just transfers heat. For heat to transfer, there has to be a temperature and pressure difference. In the refrigeration process there are two sections which produce a pressure difference: a high-pressure, high temperature section (condenser) and a low-pressure, low temperature section (evaporator). The refrigeration system removes heat from an area that is low-pressure, low temperature (evaporator) into an area of high-pressure, high temperature (condenser). For example, if cold refrigerant (40°F) flows through the evaporator and the air surrounding evaporator is 75°F, the cold 40°F will absorb the heat from the 75°F space. By absorbing the heat from the warm space, it also cools the space. It then transfers that heats to condenser (high side) through compressor. 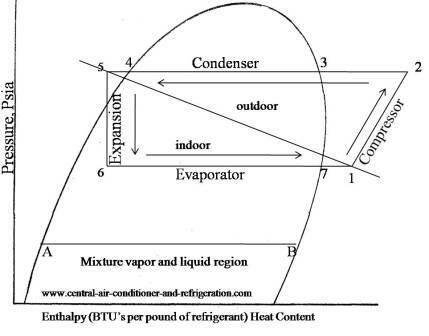 A hot refrigerant from the compressor flows to a cooler location the condenser medium (air surround condenser) for example, the refrigerant will give up the hot vapor heat it absorbs from the indoor evaporator and becomes cool again and turns back to liquid. This is what the second thermodynamics’ law stated. Air conditioning is a way to keep our home comfortable by controlling the temperature, air movement, cleanliness, humidity, or dehumidify for our comfort. To move heat from the evaporator to the condenser we need Ac Freon, and other mechanical components, therefore we need to understand how heat transfers. So how does heat transfer occur in the basic refrigeration cycle? Maybe we are wondering how hot 75°F air transfers it heat to cool 40°F refrigerant. Well, there are three methods of heat transfer. They are conduction, convection, and radiation or any combination of the three methods. Heat transfer is the movement of heat from solid, liquid or gas materials to other solid, liquid and gas materials. According to the second law of thermodynamics, heat always flows from a material at a high temperature to a material at a low temperature. For heat to transfer, there has to be a temperature difference between the two materials. Heat transfer by conduction is when we heat a copper pipe to 100°F and grab that hot copper with our bare hand (I don’t recommend that anyone should do that, it’s just for the example). That is molecule to molecule heat transfer. Radiation is the transfer of heat in an invisible ray, for example, sun ray. We cannot see it, but we can feel the sun ray hits our skin. Convection is the transfer of heat from one place to a different location by circulating it with a fan (force movement) or natural movement. Air conditioner refrigerant is a chemical substance that air conditioner units use; these refrigerants absorb heat from low-pressure, low temperature evaporator and condensing at a higher pressure, high temperature condenser. These refrigerants could be R-22, R 410a, or R134a. It depends on what kind of refrigerant the air conditioner units are designed for. Refrigerant can change state from vapor (by absorbing heat) to liquid (by condensing that heat). In residential, the Freon is R-22 and R410a. As refrigerant in the latent state or as vapor refrigerant in the process of changed state to liquid, this is the phase where it absorbs or rejects large quantities of heat. The quantities of heat absorbed or rejected can be managed by controlling the pressure and temperature of the refrigerant. The boiling point of closed-system liquid can be controlled by changing the vapor pressure above it. Gauge pressure is used to determine the pressure inside the closed refrigeration cycle system. It’s expressed in pounds per square inch gauge (psig). Heat flows from a material at a higher temperature to a material at low temperature. Heat energy is not created but converted and transferred. What are two forms of heat and where does it take place in basic refrigeration cycle? Sensible Heat when change in temperature can be measured by a thermometer or when we put our hand on an object we’ll feel heat. That is sensible heat. Latent Heat absorbed or rejected when a refrigerant is changing state from liquid to gas, or vice versa; however, the temperature remains the same. Heat is known to add to refrigerant but does not register in a thermometer, it just changed the refrigerant state (gas to liquid, or vice versa). This is also known as hidden heat. The refrigeration cycle explains to us what is happening to the ac Freon in each of the four components within the central air conditioner. It tells us how much refrigerant the evaporator absorbs, the refrigerant properties in the compressor, and how much refrigerant the condenser rejects. Understanding the basic refrigeration cycle diagram also helps us to find subcooled, superheat and to troubleshoot refrigeration processes much easier. As we can see in the Ph diagram below. Saturation curve this curve represents what state (vapor or liquid) and region (sub-cooled, latent heat, and superheat) the refrigerant is in. It also splits into two sections a saturation liquid line and a saturation vapor line. What do the saturated liquid line and the saturated vapor line show us in the basic refrigeration cycle? These lines show us the refrigerant has reached the 100 percent point. For example, saturated liquid means the refrigerant has reached 100 percent liquid (point 4) and there is no vapor. 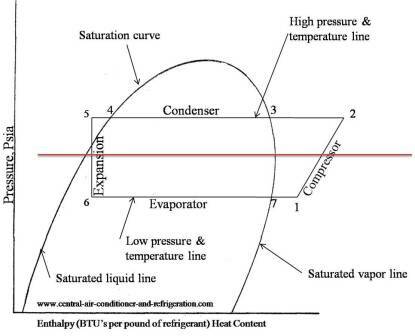 Saturated vapor mean refrigerant is 100 percent in vapor state (point 3 and 8). The area on the left side of the curve represents the sub-cooled liquid refrigerant region. The sub-cooled region is heat removed (sensible heat) after the refrigerant has reached the 100% saturated liquid state. The saturated liquid state in point 4 (The intercept between high-pressure line and saturation curve). The area under the curve represents latent heat or a mixture of vapor and liquid region (point A to B). 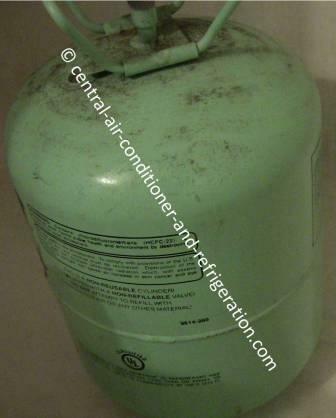 Heat that causes the refrigerant to change state, vapor to liquid or liquid to vapor. To the left of the center line within the saturation curve, the refrigerant is in more of a liquid state. To the right of the center within the saturation curve, the refrigerant is in more of a vapor state. 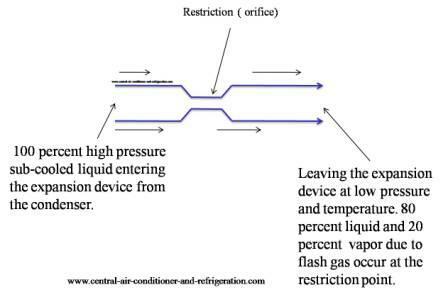 The area to the right of the curve represents refrigerant in a superheated vapor region. Superheat is heat added to the refrigerant after it has reached 100% saturated vapor state. Point three and eight are saturation superheat vapor. In any central air conditioning unit we will have five basic mechanical components: a compressor, a condenser, an expansion device (metering device), an evaporator and a refrigeration copper tube that connects them. In the typical split-air conditioning system, the four basic components are separated into two sections indoor and outdoor. I will start the basic refrigeration cycle diagram discussion on evaporator section first. As we remember, evaporator and condenser act as a heat exchanges in the air conditioning system. There are two pressure lines and two heat exchangers. The low-pressure line is an evaporator (it absorbs heat) and the high pressure line is the condenser (it rejects heat). The first heat exchange that occurs in this basic refrigeration cycle is the evaporator. The air conditioner evaporator is locate between points six and one in the basic refrigeration cycle diagram. The evaporator is a heat exchange that is responsible for absorbing heat from whatever place (medium) that needs to be cooled; for our discussion it’s indoor. Do we remember thermodynamics’ second law? This law states that heat always flows from a material at a high temperature to a material at a low temperature. Since the evaporator is at a low temperature than the air surrounding it, it will absorb the surrounding heat until the refrigerant liquid inside the evaporator coils starts boiling as result of absorb that heat. As the evaporator refrigerant has boiled completely to vapor it’s now saturated vapor at point 7. Some compressors cannot pump liquid; if it does pump liquid, it will damage it. This is why we need the entire liquid refrigerant to boil at point 7. After, the entire liquid refrigerant turns to vapor and passes point 7. Superheat occurs. Superheat is between point 7 and 1. Superheat is life insurance for the compressor. 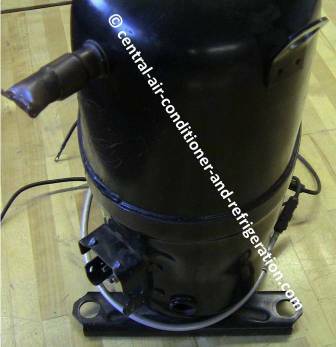 It makes sure the compressor does not pull in liquid refrigerant from the evaporator. The air conditioner compressors located between points 1 and 2 has two important lines: a suction line (low side pressure and back pressure) and discharge pressure (high side pressure, head pressure). The suction line is the line that pulls the low-pressure and temperature from the evaporator and the discharge line is the line that compresses and pushes that superheat vapor to the condenser. Its creates a pressure difference in the air conditioning system by pulling in low-pressure, low temperature vapor from the evaporator suction line and increasing it to high-pressure, high temperature superheat. The air conditioner condenser locate between points 2 and 5 is a heat exchange; it rejects both sensible (measurable) and latent (hidden) heat absorbed by the indoor evaporator plus heat of compression from the compressor. There are three important states that take place in the condenser heat rejection. The first state points 2 and 3 it de-superheat or simply rejects hot superheat vapor (it removes sensible heat). At points 3 and 4 this the state where it rejects so many saturated vapors heat, it starts changing phase from vapor to liquid; as the refrigerant reaches point 4 it is 100 percent saturated liquid refrigerant. From points 4 and 5 it removes sensible heat from the saturated liquid refrigerant. This is where we could use a thermometer and tell how much heat it has removed; as more heat is removed it’s now in the subcooled region. The expansion device (metering Device) is normally installed in the liquid line between condenser and evaporator (points 5 and 7). We cannot see it, since the device is within a compartment. In a regular split central air conditioners system it’s located indoors with or near the evaporator coils. The general principle behind any metering device is it acts as a restriction. We can see it in the diagram above. It reduces high-pressure, high temperature refrigerant from the condenser liquid line to low-pressure, low temperature refrigerant for the evaporator. What causes the temperature reducing is due to the restriction (orifice). The metering device is responsible for providing the correct amount of refrigeration to the evaporator. The operation to a metering is more complicated; however, the restriction is the principle behind every metering device. Check out refrigeration cycle for beginners. I explained from a split central air conditioning units standpoint. 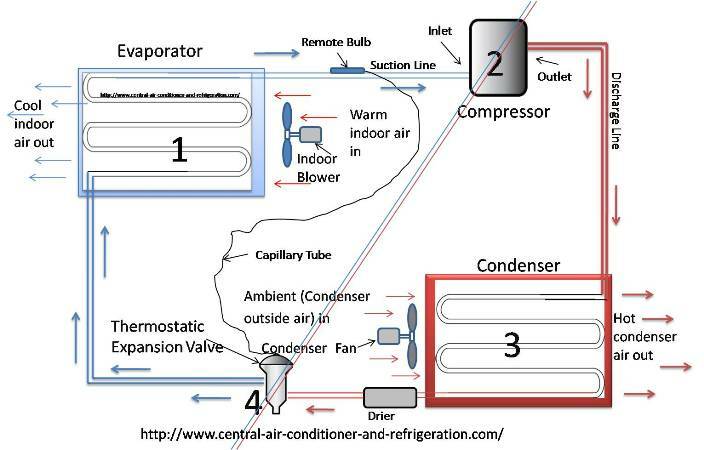 By understanding how the basic refrigeration cycle work; we also know how air conditioning works. The basic principles behind the refrigeration cycle and air conditioning are the same.